This is our second interview with the great Donald Robertson, who has worked tirelessly on behalf of the modern Stoic community. He is a cognitive-behavioral psychotherapist, trainer, and writer. He was born in Ayrshire, Scotland, and after living in England and working in London for many years, he emigrated to Canada where he now lives. Robertson has been researching Stoicism and applying it in his work for twenty years. He is one of the founding members of the non-profit organization Modern Stoicism. 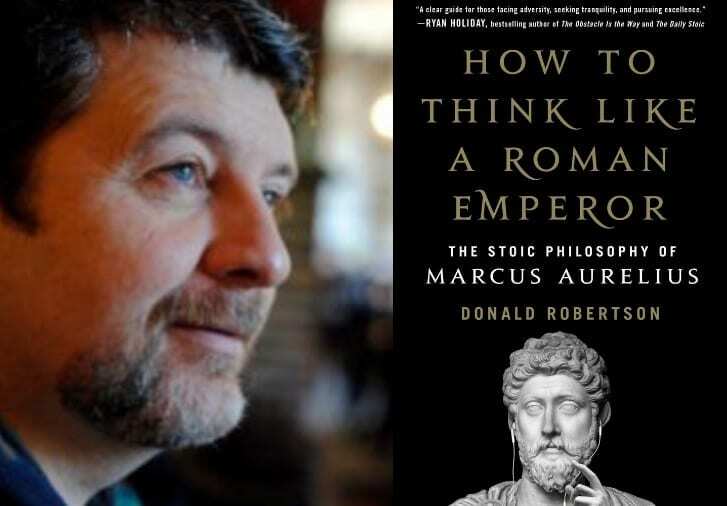 His remarkable book on Marcus Aurelius, How To Think Like a Roman Emperor, releases on April 2nd, 2019. Your new book, How To Think Like a Roman Emperor: The Stoic Philosophy of Marcus Aurelius, combines a detailed use of the historical sources as you chart the fascinating development of Marcus as a person over the course of his life. It also artfully weaves in your insight as a working psychotherapist into how what Marcus is learning along the way applies to us today. What inspired you to take this unique approach? My daughter. I’ve been telling stories about Greek mythology since she was around three or four years old. (She’s seven now.) The other kids at school talk about their favourite superhero being Batman or Spiderman. Poppy says her favourite hero is Hercules. Eventually I ran out of stories about mythology and found myself telling her stories about Greek and Roman philosophy. She particularly likes Socrates and Diogenes the Cynic. Everyone probably knows the story about Alexander the Great, the most powerful man in the world, asking Diogenes if he could do anything for him and the philosopher, who lived like a beggar, replying that he just wanted Alexander to step aside because he was blocking the sun. One of Poppy’s favourite stories about Socrates is that he used to ask people how many friends they have. Most people struggled to put a specific number on it. Socrates would observe that there’s something strange about the fact that every shepherd knows exactly how many sheep he has but most people can’t number their friends. We all agree friends are important but we don’t spend very much time thinking about who our real friends are or what makes someone a good friend. In the ancient world, philosophy was taught through lectures and discussions, and communicated in written lectures, letters, and dialogues like those of Plato and Aristotle. However, philosophy was also handed down in the form of anecdotes like these, which even a child can learn from. Many of those stories survive today, particularly in a book called The Lives and Opinions of Eminent Philosophers by Diogenes Laertius. I wanted to write an introduction to Stoicism and its practical applications in the modern world. However, I’ve already written a book like that called Stoicism and the Art of Happiness. (Which has just come out in a second, revised edition.) There are also plenty of other good introductions to Stoicism today: The Daily Stoic by Ryan Holiday and Stephen Hanselman, How to be a Stoic by Massimo Pigliucci, Unshakeable Freedom by Chuck Chakrapani, etc. I wanted to write something completely different but still accessible to the average reader, which would nevertheless give direct practical guidance about facing the emotional challenges of modern living. So I decided to take my inspiration from Poppy and write a book based around stories about the life of a real Stoic. Marcus Aurelius is the obvious choice. We know more about his life than about any other Stoic because he was a Roman emperor. There are several surviving histories of his reign, as well as other pieces of historical evidence that shed light on his character and actions, and their historical context. How to Think Like a Roman Emperor consists of chapters that deal with different challenges like managing bad habits and unhealthy desires, overcoming anger, conquering fear and worry, coping with pain and illness, dealing with loss, and coming to terms with our own mortality. Most of the chapters begin with a story about Marcus Aurelius, drawn from the Roman histories, which leads into a discussion of relevant Stoic philosophical concepts and then I proceed to discuss how, as a cognitive therapist, I would advise people to put these ideas into practice as psychological strategies in the modern world. There are already plenty of good biographies of Marcus Aurelius. (The best known is Frank McLynn’s but I prefer Anthony Birley’s.) These are great from a purely historical perspective but they don’t really attempt to explain Marcus’ personal motives in terms of his obvious commitment to the concepts and values of Stoic philosophy. That seems like a major oversight to me and I know it disappoints fans of Stoicism who turn to these books to learn more about their hero. I wanted to discuss Marcus’ life and reign in a way that relates his actions to Stoicism, his personal philosophy of life. Events in his life help to illustrate key Stoic concepts and I also find that by approaching the subject in this way we can put a human face on Stoicism and present it in a more balanced and realistic way. We more easily dispel some of the most common misconceptions about Stoicism by focusing on a real example in this way. For instance, some people mistakenly assume that Stoic acceptance of fate means passivity but Marcus was incredibly hard working and dedicated to his role as emperor. He was anything but passive. He took command of the largest army ever assembled on a Roman frontier and led the counter-offensive against a massive barbarian invasion. We can argue from a theoretical perspective that Stoic acceptance doesn’t mean quietly sitting on our hands. However, it’s much easier to point to the lives of real Stoics and show how they reconciled emotional acceptance with vigorous commitment to action in the service of justice, social virtue, and the common good. So I find that this is actually a better way of teaching people about the philosophy. The book begins and ends in a meditation on death, yet it evokes a great sense of the beauty and purpose of living. Do you think Marcus, often seen only as a dour recluse, had a unique and even positive take on the Stoic practice of memento mori? I think people sometimes read The Meditations and mistakenly assume that it’s an expression of Marcus’ personality, which seems melancholic to them because he dwells on loss and death, etc. We also have a cache of letters between Marcus, though, and his rhetoric tutor Marcus Cornelius Fronto, which provide us with a genuine glimpse into his private life. These are very different in tone from The Meditations and Marcus comes across in them as a very affectionate friend, a loving husband and parent, and someone who is good humored and yet very tactful in his dealings with friends. There’s some confirmation of that picture of his character in the Roman histories. For example, the Historia Augusta says that Marcus’ commitment to Stoic philosophy led him away from other pastimes, making him “serious and dignified, not ruining, however, a certain geniality in him, which he still manifested toward his household, his friends, and even to those less intimate, but making him, rather, austere, though not unreasonable, modest, though not inactive, and serious without gloom.” He was therefore generally perceived as genial toward others, not a reclusive introvert, and not gloomy or melancholic, which is very consistent with how he comes across in his private correspondence. The Meditations contains a series of Stoic psychological exercises, as Pierre Hadot points out in his excellent book The Inner Citadel. It’s not a diary; it’s more like an exercise book. Marcus is following a long-standing philosophical tradition by contemplating loss, misfortune, and ultimately his own demise. That’s a deliberate psychological practice he’s employing rather than a symptom of depression. Moreover, if you look closely at The Meditations you can see that Marcus is often talking about cultivating positive emotions, particularly feelings of love and gratitude. Indeed, in book one he actually describes the Stoic ideal, exemplified by his teacher Sextus of Chaeronea, as being someone free from unhealthy passions and yet full of love or natural affection (philostorgia). So I’m not sure this is unique to Marcus – I think it’s actually drawing on themes in Stoicism that go right back to Zeno – but he certainly employs the contemplation of death or memento mori in a way that’s intended to have this “positive” dimension. Remembering our own mortality, according to Marcus, helps us to achieve a greater appreciation of the here and now – to “seize the day” as Horace puts it – and to replace desire for things we don’t have with gratitude for things we’re lucky to have. Marcus cites Epictetus more than any other Stoic and he seems to me to lift this theme straight from The Discourses, where Epictetus repeatedly advises his students to embrace their fate and be grateful for life, as though they were a guest at a banquet or a festival provided by the gods. I’m glad you asked this question because undoubtedly this is an aspect of Stoicism that’s frequently overlooked by modern commentators, although it’s clearly very important. In the introduction, you talk about the loss of your father at a young age and the pain it caused you. Marcus, too, lost his biological father as a boy. Yet, as a young noble in the court of Hadrian, a very different life came together for him under the tutelage of philosophers, much as happened for you in your education. Epictetus, whom Marcus studied thanks to Junius Rusticus, called the lecture-hall a hospital—what remedies did Marcus discover there, and how did they parallel your own discoveries? Well there are actually lots and lots of Stoic remedies. In my first book on Stoicism, The Philosophy of Cognitive-Behavioural Therapy, I drew parallels between Stoicism and modern cognitive therapy and listed about eighteen general purpose psychological practices used by the Stoics. The number depends on how you choose to divide things up, though. If you look at Meditations 11.18, Marcus actually provides a list of ten different psychological techniques used for anger management. Anger seems to have been one of the main issues that Stoic therapy was concerned with. Marcus actually tells us in book one of The Meditations that he struggled to control his own temper as a young man. We can see that anger management is one of the main recurring themes throughout the text, as is coping with pain and illness, another problem we know Marcus struggled with personally. I discovered something in my own therapy practice that’s fundamental to the whole shift from second to third wave CBT. First there was behaviour therapy then from the late 1950s onward the cognitive revolution in psychotherapy, pioneered by Albert Ellis and Aaron T. Beck, which drew inspiration from the Stoics. However, from the 1990s onward the next generation of researchers and clinicians began converging on various new ideas about therapy that evolved into what we call the third wave or “mindfulness and acceptance based CBT”. Ellis and Beck placed a lot of emphasis on identifying the client’s faulty beliefs and helping them to question those and replace them with more healthy and rational ways of thinking. For instance, Beck liked to get clients to ask themselves “Where’s the evidence for that?” to evaluate the accuracy of their own underlying beliefs. However, the next generation of therapists discovered that we don’t necessarily need to challenge and modify beliefs in this way as long as we’re able to change our relationship with them, a process that Beck originally called “cognitive distancing” but the new wave of behaviour therapists call “verbal defusion”. This was a relatively new idea when I first trained as a therapist, in the late 1990s, but I gradually came round to the same way of thinking, as did most modern CBT practitioners. The Stoics knew this over two thousand years ago, though. There are many references to cognitive distancing throughout their writings. In fact, it’s probably the central psychological strategy they employ. When Epictetus says “It’s not things that upset us but rather our opinions about things” that realization is cognitive distancing – like saying “It’s not that the world is rose-tinted or gloomy but the glasses we’re wearing are making it look that way.” It took therapists decades to really wrap their heads around this idea. So it’s no surprise that academics writing about Stoicism often overlook its implications for Stoic therapy and self-improvement. Marcus likes to refer to cognitive distancing as the “separation” of our judgements from external events. The goal of Stoicism is to suspend certain value judgements responsible for unhealthy passions in this way. At the heart of Marcus’ thinking is this constant focus on actions in the present moment—taking the right ones and avoiding the wrong ones—and with this focus, a strong sense of maintaining emotional resilience in the midst of adversity. What strategies does he recommend to accomplish this? Psychotherapy, including cognitive therapy, is basically remedial. It treats problems that already exist rather than attempting to prevent problems that haven’t happened yet. As everyone knows, though, prevention is better than cure. One of the reasons why Stoicism appeals so much to psychotherapists is that it’s mainly a preventative rather than a remedial approach. Researchers today would describe that as “emotional resilience” building, a method of improving our psychological wellbeing so that we’re less likely to develop emotional problems when faced with setbacks in the future. Cognitive therapy was inspired by Stoicism but Stoicism offers a more general-purpose preventative set of skills whereas cognitive therapy is more time-limited and problem-focused. It treats a specific problem for a few weeks or months and then it’s basically over. Stoicism requires a permanent change to our philosophy of life, though. There are different ways of understanding psychological “generalization”, the way psychological skills or improvements become so broad that they help us in a wide range of situations, including ones we don’t even anticipate, leading to the Holy Grail of “emotional resilience”. First of all, if we’re able to change our deepest beliefs and values we can anticipate that will help us cope in a very broad sense. That was particularly the focus of Albert Ellis’ Rational Emotive Behaviour Therapy (REBT), the earliest form of cognitive-behavioural therapy (CBT). Ellis wanted to get right to people’s underlying beliefs, which he sometimes called their philosophy of life, and challenge that in such a way as to replace unhealthy and irrational assumptions with healthy and rational ones. The closer you get to changing your fundamental attitudes the more generalized the change is likely to be and the more resilient you’re likely to become. However, another, more behavioural, strategy involves rehearsing better ways of coping in response to a wide range of specific challenging situations. That would typically be described as a form of “exposure” therapy, i.e., exposure to a distressing situation in order to change the way you respond. We can do that in reality, using videos or pictures, or in imagination – all these methods are known to be effective although real-world exposure is the most reliable approach, of course. Let’s say that someone has a dog phobia. If we get her to imagine petting a dog repeatedly eventually her anxiety will abate naturally, through a very well-established process known as “emotional habituation”. She can also help herself by practising new ways of thinking about the situation and other coping skills and statements, although therapists often consider these unnecessary. Then she might watch videos of dogs and eventually go to the park and gradually approach and pet real dogs, repeatedly, under controlled conditions, until her anxiety permanently wears off. Wait, though…There are lots of different breeds of dogs. Exposure, whether real or imaginary, has to be to a specific example, though – one dog at a time. So if someone has habituated to labradores do they then have to repeat the process for poodles and chihuahuas as well? No, because the change tends to generalize. They might need to encounter, in reality or imagination, a few different types of dogs in different settings for that generalization to properly take place but they won’t need to go through this process for every conceivable breed of dog. Moreover, often successfully overcoming a specific phobia will make someone generally more self-confident. Nevertheless, we can enhance the general benefits by exposing ourselves to a wider range of different challenging situations. Marcus and the other Stoics would do this by deliberately rehearsing every major type of adversity that commonly befalls mankind: betrayal, disease, warfare, poverty, etc., and even death. Seneca calls this the premeditation of adversity, or bad events: premeditatio malorum. It actually resembles a well-established cognitive-behaviour therapy approach called Stress-Inoculation Training (SIT), which typically involves real or imaginary exposure to a variety of situations. In The Meditations, Marcus explicitly talks about mentally rehearsing encounters with annoying people, who are deceitful, meddling, treacherous, and so on whereas Seneca talks more about anticipating external misfortunes like poverty, illness and exile, etc. Picturing a range of situations, repeatedly, and in the right way, is the key to building more general emotional resilience. That’s what the Stoics did. In our last interview, you talked about working more to incorporate empathy, a core component of Stoic Ethics, into your work and daily life. Many people like to see Marcus as a misanthrope, but isn’t it really more that he’s pushing himself toward a kind of radical empathy that’s not always comfortable, especially for those in power? Anyone who sees Marcus as a misanthrope is definitely way off the mark. He was known for his clemency and philanthropy. I would say the major theme running through the whole of The Meditations is the concept of social virtue in Stoicism – justice, fairness, kindness – as well as ethical cosmopolitanism, natural affection, and the fundamental concept of developing a healthy and harmonious attitude toward other human beings in general. He mentions the interpersonal or social aspect of Stoic virtue on virtually every page – perhaps it was of special interest to him because of his role as emperor. What you’re talking about is the way he refers to anticipating betrayal, meddling, and deceit, etc., from others. In the same way that his contemplation of death and misfortune can come across as pessimistic, what he says about expecting the worst from other people can perhaps make him sound misanthropic. But he wasn’t. He’s just engaged in a psychological exercise. Like you say, he’s attempting to develop a particular type of empathy, a philosophical attitude toward humanity, which embraces them warts and all. Marcus perhaps doesn’t state this clearly but he’s committed to the paradoxical view that all human beings, himself included, are fallible and imperfect, foolish and vicious, and yet nature has given us all the potential for wisdom and virtue. His basic attitude toward others is natural affection, like the love of a parent for their children, or siblings for one another. The Stoics are also modeling the paternal attitude of Zeus, viewed by them as the father of all mankind. They want to anticipate other people’s flaws without judging them harshly, blaming them, or becoming angry with them. Fundamentally, Zeno wanted us to live in harmony with the whole of Nature, anything else is a form of impiety. That includes a sort of acceptance, a harmonious and affectionate attitude toward other people, even when they behave like our enemies. Perhaps the easiest way to explain this is to say that Stoic ethics can be viewed as a precursor to Christian ideas about the brotherhood of man, and loving your neighbour. That flies in the face – as I think you’re suggesting – of the tendency for political demagogues to scapegoat certain groups, such as minorities, political rivals, foreigners, people who follow other religions, and so on. That’s the opposite of Stoic cosmopolitanism. Although Marcus fought a long and bloody series of wars against foreign invaders, it’s striking that in his personal notes he refers to the common welfare of mankind, not just of Roman citizens. I believe there are also indications from Marcus’ life that he extended moral consideration to Rome’s enemies. For example, we’re told that rather than enslaving captured Marcomanni and Quadi he offered to resettle them within the Roman empire. The Sarmatians, who were nomads and could not be resettled in this way, were recruited into a special cavalry unit, in order to secure peace, rather than slaughtering or enslaving them. Perhaps that sheds light on the cryptic passage in The Meditations where Marcus says that for someone, presumably a Roman general, to take pride in capturing Sarmatians is to display the character of a mere robber or brigand, perhaps implying that enslaving captured foreigners is something fundamentally unjust (10.10). In the book, you treat the tough issues of pain, fear, and anger in separate chapters. We’d like you to do a series of guest posts on these themes, but for now, can you tell us about Marcus’ approach to these issues, and how you use his insights in your work? When people think of coping with chronic or acute pain, and other symptoms of illness, they often think of stoicism, the stiff upper-lip coping style that consists in concealing or repressing emotional distress. There’s a body of scientific research that shows that can be very unhelpful, though, so it’s important to distinguish “stoicism”, the unemotional coping style, from “Stoicism”, the Greek philosophy followed by Marcus Aurelius. Greek and Roman Stoicism inspired cognitive therapy, as we’ve seen, which is actually known to be an effective approach to coping with pain. The Stoics clearly distinguish the sensations of pain and discomfort, which they view with neutrality and indifference, from our emotional distress in response to pain, which they view as, at least in part, under our voluntary control and worth improving. Most people feel frustrated with pain, focus on it, and struggle with it emotionally, and even in terms of their behaviour. The Stoics teach a radical acceptance of pain, which is actually consistent with modern evidence-based psychotherapy. As the early 20th century psychotherapist, Paul Dubois, said: the Stoics teach us that he who knows how to suffer suffers less. When we accept pain, we tend to end up paying less attention to it and experiencing less emotional distress. That removes a layer of suffering from our experience but over time it can also lessen our experience of the painful sensations themselves, if we’re lucky. The Stoics had a model of fear that’s very similar to Beck’s cognitive model used in early CBT. Fear is the belief that something bad is about to happen. Rather than challenging our predictions about what is or isn’t likely to happen, the Stoics focused on challenging the assumption that anything that befalls us in life, due to external events, can really be that bad or harmful. Stoic ethics argues that our own character is far more important than external events. If we can learn to place more importance on our own actions than what happens to us we potentially alleviate the root cause of much distress. Moreover, the Stoics trained themselves to ground their awareness in the present moment. Anxiety, though, is future-focused and tends to involve worrying about what might happen. The more we can centre ourselves in the here and now the more we tend to weaken the grip of worry over our emotions. Anger was an emotion the Stoics were especially concerned with. We actually have an entire book by Seneca called On Anger, which survives today. As we’ve seen, Marcus also has a lot to say about anger. For Stoics, anger is the desire to punish or take revenge against someone for a perceived transgression. It’s typically based upon the belief that we, or something we care about, has been harmed. The most fundamental Stoic strategy is therefore to challenge the belief that anything another person says or does can actually harm us. It can damage our reputation, or property, or health, and so on, but it can only injure our character, according to the Stoics, if we let it do so. There are many other strategies described by Marcus but his favourite appears to be to remind himself of the Stoic doctrine that humans are inherently social creatures, who form communities in order to survive. He therefore believes that we have a duty to try to help one another and live harmoniously, which opposes anger and the desire to do harm. Tim Ferriss has an exercise he calls “fear-setting” inspired by Seneca and the Stoics. You’ve talked about exposure therapy here before. Do you see fear-setting as a version of that, and how do you use it or something like it in your work, and do you think Marcus did as well? I was known as a “techniques guy” in psychotherapy. For many years, I trained other therapists, and I specialised in teaching them a wide variety of different cognitive, behavioural, imaginal, and verbal, therapy techniques. So I’m always interested in learning about new variations of techniques, comparing, and classifying them. I’ve seen Tim Ferriss’ video about Stoicism before and found it quite interesting. He begins by describing the Stoic exercise called premeditatio malorum or the premeditation of evils. (I prefer to say “adversity” because external things aren’t really “evil” for Stoic ethics.) Tim says he finds it hard to picture worst case scenarios in his mind’s eye so he developed another technique he calls “fear-setting”, as opposed to “goal-setting”. First he picks a change that he wants but is afraid of making, such as moving to another city. There are three columns headed “define”, “prevent”, an “repair”. He writes down a list of everything that could go wrong in the chosen situation under “define” – the worst things that could happen. In the “prevent” column, beside each aspect of the problem, he writes what he could do to help stop it from happening, or at least minimize the likelihood. Under “repair” he writes what he could do even if the worst actually happened. This includes what other people might do to cope with a similar problem or what they might recommend doing. This is process is very similar to what cognitive therapists call “decatastrophizing” and developing a coping plan. It’s a cognitive strategy for re-evaluating a feared situation, and downgrading the perceived level of threat to a more balanced and realistic level. Tim follows this by describing a technique that involves identifying the benefits of an attempt or partial success. These are typically positives that help to build motivation. He also imagines the, typically negative, consequences of inaction – not addressing a problem – 6 months, 1 year, and 3 years in the future. That’s a very common technique in modern cognitive-behavioural therapy (CBT). It’s basically a form of what therapists would call time-projection or “cost-benefit analysis”. Often cognitive therapists will ask clients to compare two courses of action and compare the consequences, short-term and long-term. So that might be remaining with the status quo versus changing by following a treatment plan, and tackling your problems. In some cases, you might want to go into more detail and consider the pros and cons of each path. That can be helpful because in the short-term there are often perceived benefits (pros) to the status quo and costs (cons) to changing. However, the longer-term consequences can outweigh these so that’s why it’s important to practice expanding our perspective further into the future. Some people benefit from this as an intellectual exercise but it’s often more powerful when done visually and repeatedly, so that it’s more experiential and evocative of emotions. It’s useful to picture two contrasting paths ahead because that highlights the way they tend to diverge further and further over time. This technique has several uses but it’s particularly helpful for building motivation at the beginning of therapy, especially where a client is going to be asked to do something as part of the treatment that requires patience or effort. That’s important, for instance, in exposure therapy where the client may feel that repeatedly facing their fears is uncomfortable in the short term, although it may be better for them in the long term. What’s missing, perhaps, from this discussion is the role of emotional habituation, which we mentioned above. For example, Beck advises clients suffering from anxiety to picture feared events as vividly as possible for a prolonged period, maybe fifteen minutes, so that anxiety naturally abates. Once that happens, it tends to be much easier for people to think about the situation calmly and rational, to problem solve, and develop coping plans. We know that it takes time for anxiety to habituate so people have to be encouraged to be very patient when doing exercises like these, and not to rush things. If we just wait long enough, the anxiety will almost always reduce of its own accord, eventually, and it then becomes much easier to think straight and figure out how to solve the problem. This sort of habituation does tend to work better when we actually picture a situation vividly, though, rather than just writing down a short description. The most common way to help people who say they find it difficult to visualize the scene properly is simply to ask them to write down a detailed description, maybe a page long, and then to read it aloud while picturing what they’re talking about – that usually makes it much easier to focus on the imagery. What the Stoics did tends to resemble this sort of cognitive re-appraisal of the feared situation, and our ability to cope, so it’s actually closer to decatastrophizing and Tim’s “fear-setting” than conventional exposure therapy, although they also seem to have been aware that anxiety abates naturally over time. One of my favourite maxims from The Meditations is something Marcus says to re-appraise situations in this way: “this is no misfortune, but to bear it with a noble spirit is good fortune” (4.49). Elsewhere he reminds himself that nothing befalls us in life that we’re incapable of bearing, or coping with, and that even foolish and bad people have managed to deal with whatever problems we face, so we should be able to cope as well if not better in the service of wisdom and virtue (5.18). We can model ways of coping with some situations, in other words, even from people who are otherwise flawed. Marcus seems to be advising himself to curtail worry and catastrophic thinking here. When people worry they typically have thoughts about their inability to cope such as “I can’t deal with this!”, “It’s unbearable!” and so on. Marcus is challenging precisely this sort of thinking by questioning whether anything he faces is really “unbearable”, and, like in Tim’s approach, that means arriving at a more balanced and realistic re-appraisal of his ability to cope. Perhaps it’s not really unbearable or a catastrophe after all. He concludes by focusing on the here and now, and taking one aspect of the problem at a time, something we know to be typical of a rational problem-solving style of thinking, the opposite of worrying. I understand you’ve got some interesting travel planned that involves both Marcus and Socrates, can you tell us about that? I’m going to Vienna soon and then to nearby Carnuntum, where Marcus Aurelius wrote The Meditations (at least part of it). I’ve been talking to the staff at the Carnuntum museum who have kindly offered to help me shoot videos and to provide interviews about the history of the site. Carnuntum was the location of an important Roman fortress, where Marcus stationed himself during the Marcomannic Wars. I have a videographer coming with me, Adam Piercey, and we’re going to shoot some video at various locations there and I’ll also be doing some podcast interviews about Marcus Aurelius and some online Q&A sessions “live from Carnuntum”. According to one account, Marcus died at Vienna so we might do some blog posts or videos there as well. After that I’ll be in Athens for a month, where we’re making preparations for the Stoicon 2019 Modern Stoicism conference. Last year I spent a couple of months in Athens, shot some videos and did some posts with photos of archeological sites, etc., for my course on Socrates. I’ll be in Athens in April and then again around September or October this year for the conference. We’re looking forward to “Stoicism coming home” to Athens and hoping to organize some walking tours and other events to show attendees a few of the historic locations in the city that have to do with Socrates and Stoicism. For example, the Acropolis is the most prominent tourist attraction in Athens – it’s a hill with temples and other buildings, around which the rest of the city sprawls. Socrates and other Athenian philosophers would have been very familiar with the view from the Acropolis. You would have been able to look down on the agora, the city centre and market stalls below. When philosophers right down to Marcus Aurelius describe the View from Above, the busy world of men seen from high overhead, they’re describing something that actually resembles the view of Athens you get from the Acropolis. I’m hoping that during this trip I’ll get some inspiration for a graphic novel that I’m planning about the life and philosophy of Marcus Aurelius. I find it very inspiring to go to these places and it definitely helps me to write and give talks about philosophy. Finally, what’s your favorite Marcus Aurelius passage? This is a bit of a quirk perhaps but in general I really like book one of The Meditations because it tells us so much about Marcus’ relationships with his family and tutors. So it provides some interesting historical context and deals with the intersection between his life as emperor and his moral and psychological development as a Stoic philosopher. As a therapist, who’s obsessed with classifying techniques, one of the other passages that I like most is 11.18 where Marcus gives us a list of ten gifts from Apollo, the god of healing, and his Muses – psychological techniques for managing anger. The part that fascinates me the most is where he envisages talking to another person who’s becoming angry with him and saying: “No, my son, we were born for something other than this; it is not I who am harmed, it is you, my son, who are causing harm to yourself.” We know those are two of his favourite anger management techniques so here can glimpse the value he places on trying to educate others, according to Stoic principles, rather than becoming angry with them. Donald’s new book is out now! If you haven’t already, pick up a copy of How To Think Like a Roman Emperor—a wonderful introduction to one of history’s greatest figures and a clear guide for those facing adversity, seeking tranquility and pursuing excellence.